Cooking and kitchen gadgets scare me. I’m not embarrassed to admit it… I’m tech savvy but kitchen challenged. Consumer electronics are intuitive and easy for me to understand…. but cooking technology is another story. When the folks at Keurig asked me to join the Keurig Vue Twitter Party and receive a unit to review, I was excited to participate and finally conquer my culinaryphobia with the newest in coffee tech. Using the Keurig Vue, I concluded that making different hot beverages for all the members of my family is both EASY and yummy, and the technology is very impressive. 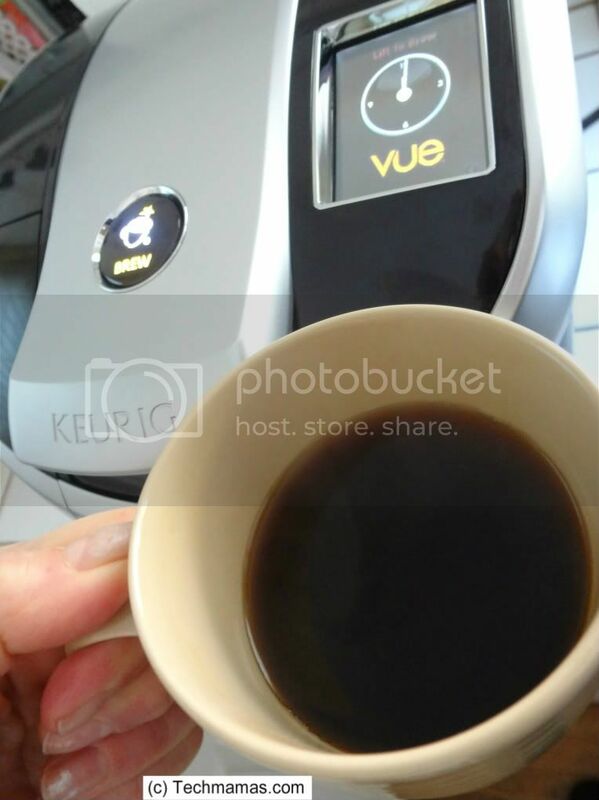 The Keurig Vue custom brew, single-serve beverage delivery technology allows me to brew coffee strong or regular, Latte with foam or iced tea, hot chocolate, hot tea and more. The high-tech brewer adjusts water pressure, timing, and airflow to brew to taste. 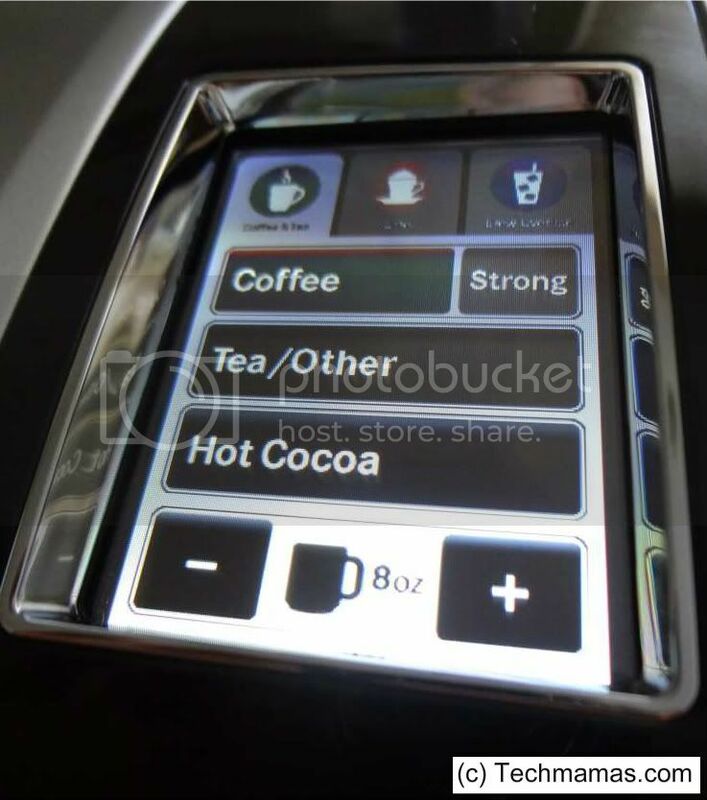 The programmable settings offer temperature, strength and size selections so my husband can get his extra hot, extra strong coffee while I can have my tall regular coffee. The eight brew sizes range from 4 oz. to an 18 oz. travel mug. The removable 74 oz. water reservoir means that I don’t need to fill the water every day or when we are entertaining many guests. Best of all, it brews each cup in under one minute, which I need with my busy schedule. To keep on our eco-friendly roll (we just started composting), I appreciate that the Vue packs are made from recyclable polypropylene #5 plastic. I found the recycling locations by checking the Keurig Vue recycling website. The digital controls let me know both what I need to do and what step I am on. For example, when I turn on the Keurig Vue, the controls show me that the brewer is pre-heating. 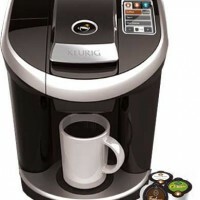 It is easy to pop open the lid to add the Keurig Vue pack of my choice when I am ready to brew. Then I can select which beverage I am brewing, the strength and the beverage size. If I were brewing a beverage with froth or ice – then I would select that setting. 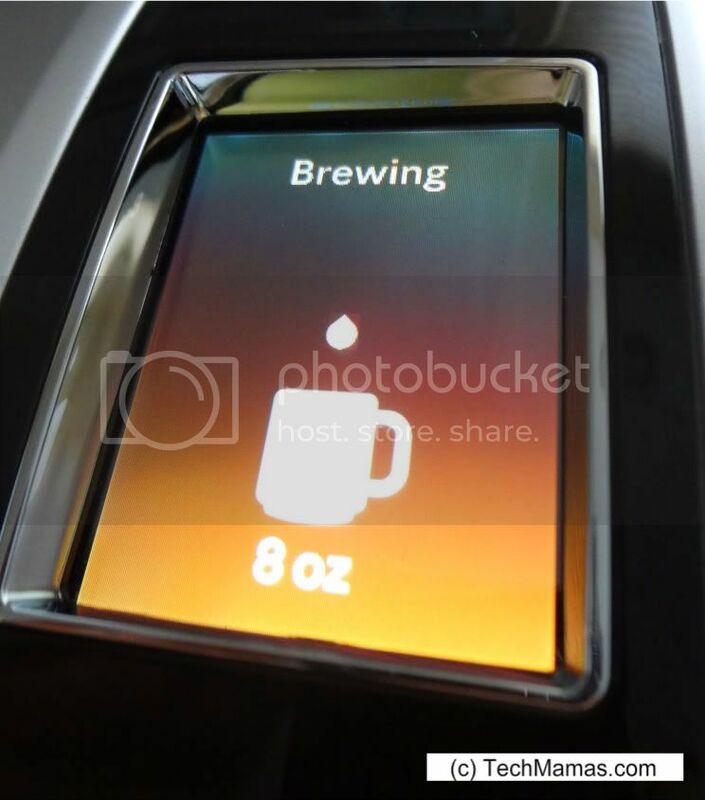 After I make my selection, I was happy to see that the controls show me that the beverage is brewing. In under a minute I had myself a hot, yummy cup of coffee. It was easy enough for even culinaryphobias like myself to use. The only frustration I had was that I raced to the store to buy more Keurig Vue packs last week – then realized they are not coming out until early March. Ah…. such a dilemma… to be patient for great coffee. Disclosure: I was compensated to participate in the Keurig Vue Twitter Party on February 16, 2012 and received a Keurig Vue unit to review. All of my opinions and words are my own. This is my first experience with the Keurig System and just received the unit. I will post an update after I have taken it for a full test drive.